Pupils and staff at Willow Wood Primary School are starting the summer term in an inspirational new £730,000 learning environment. 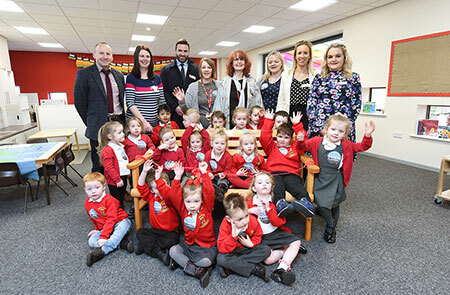 The school in Winsford has had a major refurbishment to accommodate more pupils with a new nursery, two reception classrooms, offices, and hygiene and parent rooms. Cheshire West and Chester Council paid £500,000 of the total cost of the work after successfully bidding for £230,000 from Central Government. Sue Tomlinson, Willow Wood Primary School headteacher, said: “We are so lucky to have this amazing space to learn in, it’s a teacher’s dream. The children are so focused, engaged and busy, it’s brilliant to see. “The outside space is fantastic too and I look forward to seeing the children exploring, playing and developing their skills in their new learning environment. Mark Parkinson, the Council’s Director of Education, said: “I’m delighted that we were able to secure funding to allow the expansion of Willow Wood Primary school. We welcome the development and I’m sure the children will feel comfortable and eager to learn in their new classrooms. This provision will offer improved opportunities for children and their families in the future and complements the excellent provision that already exists in the area. Crossfield Construction carried out the work and formed a strong relationship with the school to keep everyone up to date with the building process. The architect Steve Fitch, project manager Chris Pearson and the Crossfield team attended parents meetings and events at the school and also hosted school assemblies to teach the children about health and safety. The company demolished and remodelled existing classrooms during school holidays to avoid affecting the normal school day. The rest of the work was able to be done during the school term in a separate part of the site. A viewing platform was set up so that pupils could safely keep an eye on the building work at all times. John Paul Cassidy, Operations Director at Crossfield Construction, said: “We are delighted to have handed over our works at Willow Wood Primary School. This has been a challenging project working in a live school environment, and our engagement with the pupils and staff has been important throughout.